These themes were explored in four papers presented on a Friday afternoon. Here Katrien Pype presented a recent chapter on ”Smartness from Below” calling for a closer attention to local vernaculars about technology and ”being smart” - and their relation to fantasies of development and ”smart cities”- in Kinshasa. These considerations neatly set the stage for the other papers in the panel; on repair and maintenance of electricity meters in Maputo, by Idalina Baptista, urban finances and mobile money in Eastern African cities, by Daivi Rodima-Taylor and William Grimes, and the politics and contestation of sanitation infrastructure in South African former townships by Steven Robins and Peter Redfield. In a panel on women’s roles in negotiating health and healing in Africa, Nanna Schneidermann presented a paper on ”technologies of motherhood” based on recent fieldwork in Cape Town. Overall the papers engendered discussions about the need for more “use-centric” studies and approaches to technology in Africa cities, and how these in turn might refine the concept of technology itself, as it is placed both in histories and in specific contexts of use. On May 9 2017, Katrien Pype presented preliminary analysis of her research on CB radio communications in Kinshasa. The presentation was part of the seminar series of the (Belgian) Royal Academy of Overseas Sciences. Mobile phone technology constitutes only one, and a fairly recent, platform for connectivity with “elsewheres”. I focus here on radio phonie communication, a technology commonly known as citizen broad band radio, that has ensured long-distance dyadic communication in DR Congo since colonial times, and doubles as a money transfer agency. Recently, this outmoded communication platform has known an upsurge in Kinshasa in order to enable connectivity with regions in the former Bandundu and Equatorial Provinces, areas without cellular coverage. First, I examine phonie connectivity, and especially the affective dimensions of this long-distance interaction and link this tot the position of Kinois as “city-dwellers” trying to cope on the one hand with the socio-economic predicaments of life in an African metropole, and with claims –interpellations- made by relatives or intimate Others residing in the hinterland. Second, I highlight a material dimension to Kinois’ connectedness in order to acknowledge the role of technology in the shaping of modern sociality. Finally, I argue that the publicness of phonie talk – usually acted out in front of other phonie clients and the phonie operator, who contribute to the conversations – offers techniques for living with the interference from the urban into the rural and vice versa. By exploring “interference” as a technical and a social experience that people – not just in Kinshasa, but anywhere, where long-distance connectivity is lived – actively manage, the paper highlights the affective dissonances associated with the reduction of spatial distance through modern communication technologies, and thus brings nuance to the narratives of hope and anticipation, especially expectations for economic and material betterment, accompanying innovation in communication and the trope of global connectedness. The material thus offers an interesting perspective on the co-habitation of so-called "old" and "new media"; while also bringing to the fore the longue duree of electronically mediated translocal connectivities. Katrien is currently transforming the presentation into an academic article to be submitted to the journal of the Royal Academy of Overseas Sciences. The chapter is an attempt to call for more attention to the cohabitation of techne experts in African societies. In this way, I propose an alternative interpretation of "the smart city". There is considerable attention to the continuation of the social positioning of healers, blacksmiths, media practitioners and engineer students. In addition, I explore the linguistic closeness of various forms of knowledge in the urban sphere and the handling of tools. The endeavor of the whole book is to propose an Africa-centered understanding of technological innovation, going beyond the familiar tropes of appropriation and creativity. The book is the outcome of a workshop at MIT held in October 2014. Pype, K. 2017. "Smartness from Below. Variations on Technology and Creativity in Contemporary Kinshasa." In: Mavhunga, C.C. (ed. ), What do Science, Technology, and Innovation Mean from Africa? Cambridge: MIT Press. Chapter 5: 97-115. Shari Thanjan holds a BA Hons in anthropology from UCT and is a specialist in maternal and child health interventions. For the past six months she has been working as a field assistant with the MediAfrica project. A cellphone always becomes some sort of a fictional companion in your life. It’s so easy to grow attached to material things, holding you to all your networks and traits of your personality. Your phone becomes a friend in times of need. This piece is about a heartbreaking journey between me, my phone and I. And it leads me to reflect on the research we have been doing on mobile phones and motherhood in Cape Town. The whole debacle started when I took it to a music festival a few months back. Music festivals are always a risk for all your belongings. You can always lose your most important valuable items, which usually include a bankcard, your favourite items of clothing and of course, your cellphone. On event pages on Facebook, there are always posts of people looking for missing items after the party. Being a “joller” (in South African terms a person who goes out dancing a lot), I have mastered the art of not losing my most important belongings despite partying hard. So, off I go to a music festival with my “I’m a responsible joller who doesn’t lose her things attitude”. Putting my phone in a safe place, keeping my bags closed tightly and always on my back to avoid losing my phone. Coming home on the Friday night, I was extremely chuffed with myself for not losing anything. The next morning I went for a breakfast with my friend, happy as a hummingbird. This happiness was cut short, as my phone suddenly fell on the ground whilst getting out of the car to come home. In shock I quickly picked it up to check if the screen cracked. A sigh of relief, not one crack! Then, as I turned it on, the screen remained blank, black, dead. I immediately started thinking of things I could do to fix it, thinking maybe I could put it on the charger and then it will come back to life. My mind started racing with all sorts of silly ideas. I felt so stupid, as all my “responsible” actions, the night before, putting my phone in a safe place, keeping my bags closed tightly and always on my back to avoid losing my phone, were apparently for nothing. So, there I was in an ironic situation, annoyed with myself and the universe. Firstly, and most importantly,the phone held the ties to my boyfriends. My one boyfriend, who is sort of an ex but still a friend ( its complicated) asked me to behave while I was at the music festival and report to him, where I was and how I was doing, as he needed to know(apparently) that I was safe. Then, a boy I had been crushing on for years, was at the festival and I had drunk-texted him at three am confessing my dear feelings and was still awaiting his response that Saturday morning, but alas, my dear phone broke .Until today, I don’t know what his reply was! I always wonder if a potential and blossoming romance was cut short, by my broken phone. Obviously, it was not meant to be, but a girl can dream sometimes. Secondly, my broken relationship with my phone affected my friendships. Of course at a festival in a city where you have many friends, you want to meet with them for pre-festival fun. Now I could not contact any of my buddies, getting some disappointed moans from friends when I saw them later that evening. Further, without my phone I worried about my safety, potentially getting lost, and not having the ability to contact my people, or uber home. So my whole social circle and interactions, which are particularly important in the light of a music festival weekend, was all lost within that moment of my phone breaking. Part of going for a good party these days is capturing all of the music, videos, pictures, the venue and gorgeous selfies on your cellphone. Just for keeps or to share on Instagram, WhatsApp or Facebook, to show the world what a marvellous time you had . I worked hard on the Friday night taking as many cute selfies and beautiful pictures as I could, only to have it all lost. It tried to borrow my friends phone, which is difficult as their cameras work differently and sometimes their memory gets full and stuff. Eee, I guess one should just live in the moment, right? Well, now I didn’t have a choice! Without my phone my personal life seemed to be in shambles. But worse, my job as a research assistant was set back. All of my research participants contact details were saved on my phone as well, and now I wondered how to even get in touch with them. Believe me, some of them were hard to come by. And what about doing interviews? All my recordings of interviews were done on my phone. We had also collected something we called media diaries from participants, which is a documentary of their everyday lives recorded on their phones. Though we had wisely made backups, I could not view this material on my phone any longer. How could I do my work with no phone? It was so heart breaking. I was so upset and there and then, with my broken phone. A material object I owned had the ability to break my heart. There wasn’t much sentiment attached to my phone as an artefact, but more emotion attached to the services it could provide me with- ranging from the camera to the social ties and work - it was all gone. Yet, in the midst of all this agony there was a light. Through doing many interviews in poverty stricken areas in Cape Town, I soon came to realize that my agony was shallow, and honestly quite silly and I should not have been so upset. Many of the mothers we spoke to did not have smartphones, or even phones. Their reason for this was its unaffordability as the prices of data in South Africa are unaffordable to most, but also more disconcerting was: Some were afraid to be robbed, if they had a (nice) phone, and some did not have a phone because it had already been stolen. While I fret and worry about Facebook posts, many people had access to Facebook as part of a data saving network plan, whereby one couldn’t see pictures and videos, only writing. Many of our research participants hardly went on social networks. Some avoided it purposefully, to avoid all the social drama attached to networks. The moms we worked with who did have a phone often bought a WhatsApp bundle for R12.50, which lasted them the whole month, and did not include downloading of pictures and videos. Many survived with just this as their main form of communication with partners, family and friends. 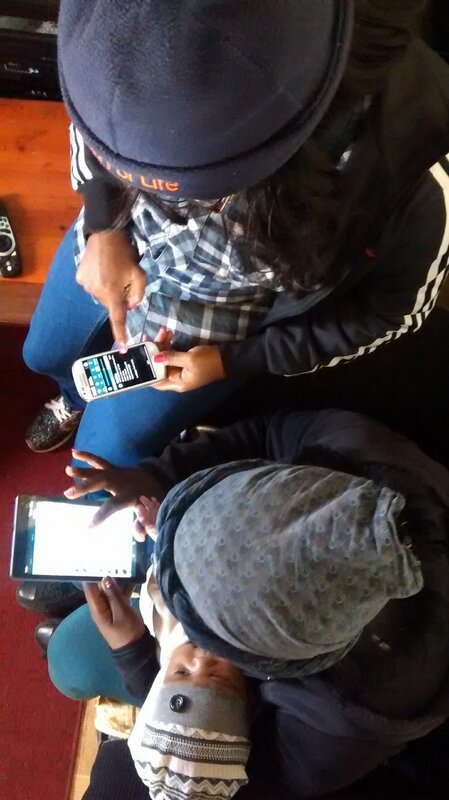 While sitting in the clinics, trying to get moms to register on MomConnect, many of the moms were not even interested in their phones, or had any idea how to use it. This happened with moms of all ages. I had to assist most people I met with the whole procedure. My time in the field and comparison with my own phone really made me realize, that even though statistic screams that South Africa has 100% mobile penetration, it is not even so. South Africa is a majority poor country. Yet, although there are many mobile interventions deriving from policy, pushed into South African programmes, it seems that end user was not considered, basically, the people of South Africa. In almost every interview I did, or people I met throughout fieldwork could not afford the phones imagined for the mobile interventions. Going back to my drama, my fieldwork really showed me that a phone is not everything, and one can actually live a happy content life without it. The participants in the research showed me this, and helped me, well, get over my self and my phone. I think leaving the field is one of the worst parts of being an anthropologist for a living. Life as I have come to know it in the field collides with life as I used to know it at home. It is one of the big steps of data processing; transforming the lived life, shared concerns and thoughts, experiences, aesthetics and skills learned during the fieldwork from “stuff that is going on in my life” into “data”; the object of analysis and writing academic texts and the like. Suddenly everything, both “here” and “there,” is strange and awkward. The boundaries between the field and home are in anthropology increasingly permeable, but maybe that just intensifies the movements as different modes of engagement with the world. Me and the awesome assistant Shari felt this in full a few weeks ago, as we finished up and said goodbye to friends at Hanover Park MOU and at the courts we had been hanging out at, and then drove straight to University of Cape Town for me to present at the research seminar of the Department for Anthropology. We were late, and I was nervous and had bad stage fright. Luckily the theme was Permeable Boundaries, and I was presenting with my buddy Rogers Tabe Egbe Orock from Wits University. We talked about the concept of “BIGNESS” and power in our fieldworks in Cameroon and Uganda, and in African anthropology more generally. But we also talked about our shared background as PhD students in Århus and the pathways of being a young(ish) scholar. The questions from students and colleagues led to important discussion about stereotypes in African politics and the materiality of fame and power. Letting the calmness and openness of hanging out at Hanover Park seep into the seminar room for me brought a gentleness and humor to a genre, the staff seminar, that us usually either dreary or scary. The seminar also marked the end of my time at UCT as a visiting fellow, and I left Cape Town grateful for the wisdom, tough questions, and generous help and friendship from colleagues at Anthropology and the First Thousand Days research group. In development policy and public discourse mHealth is at times seen as the Promised Land. Something that potentially can cut at least 25% off health expenditure and improve health systems and the delivery of services to citizens. So what does the Promised Land look like from the point of view of those bringing it about? This South African summer and fall I’m spending some time broadening my horizons and experimenting with interdisciplinarity. On December the 14th 2016, from 6 PM Morten Jerven, Economist and Professor in Development Studies at NMBU (Norway) and Grieve Chelwa, Economist and Post Doctor at Center for African Studies, Harvard University will meet to discuss economists (mis)understanding of Africa's economic development and what is acutally happening on the continent. The seminar is open and hosted by Norwegian Concil for Africa and takes place in Kulturhuset, Youngstorget 3, 0181 Oslo. I’m back in Kampala. I have been away for five years, and return now, to see people who have been my family and friends. I am of course worried; will they remember me? I better not impinge on their lives, just politely pass by. The city, however, has other plans. The Center for African Studies Workshop, taking place in Robinson Hall on campus and headed by Jean and John Comaroff, is a weekly event in which various scholars present work that in some way is related to Africa. This is an initiative that the Comaroffs brought with them from the University of Chicago to Harvard. It has become a hub of the Africanist melieu at Harvard, gathering both students, staff at the univerity as well as interested outsiders and visitors. In addition, the seminar is incorporated into undergraduate and graduate teaching at Department of African and African American Studies ands the papers are thoroughly discussed in classes beforehand. On the 26th of September 2016 Jo Helle-Valle gave a presentation, based on fieldwork over a quarter of a century in Botswana, titled "Seduced by Seduction - being a man in Botswana". (Read the abstract here.) The full paper was disseminated a week before to all members of the workshop. The workshop opened with the author presenting the paper's main argument and situating it within a wider academic landscape. Then dr. Lorena Rozzi, from Department of History at the University of Bielefeld, Germany, and a visiting scholar to Harvard, served as discussant before the floor was open for all. Valuable comments will be incorporated into the reworking of the manuscript. Digital technology is transforming the way in which elections are held globally, including on the African continent. With young voters comprising a substantial part of the electorate, political campaigning is increasingly shifting online. As LSE’s Wendy Willems argues in the second article of a series about the role of digital technology and social media in Zambia’s recent elections, political parties tapped into digital youth culture in a number of interesting ways. ICA Africa 2016: Communication, Theory, Africa. Two of the researchers in the MediAfrica project presented at the recent ICA Africa conference in Nairobi. Do mobile phones set citizens free? In postcolonial Kinshasa, citizens use mobile phones (and smartphones) are as tools to deceive the state but also to expose fraud. The Congolese government is also strongly aware of the revolutionary capacities of new media. In 2011, text messages were blocked; and in January 2015, the government shut the Internet for a few weeks, gradually opening up Internet while blocking social media platforms such as Whatsapp, Facebook, Viber and Skype. It is clear that political change on the continent is not only documented by citizens filming and photographing protest and abuse, but these also feed into the ways in which citizens and the state interact. One should however always be careful to situate these mass-mediated interactions within complex postcolonial histories of governance and political communication. Kinshasa's elderly people dance in TV music shows to counter the negative stereotypes of "African elders"
Fieldwork on media participation among Kinshasa's elderly people has shown that they are not that invisible in the city's popular culture. Rather, TV dance shows in which elderly Kinois (inhabitants of Kinshasa) perform cha cha cha, bolero and rumba (among others) and in which they speak about the earliest days of Kinshasa's nightlife scene are important platforms through which the elderly communicate with the city at large, and especially with the youth's popular culture. The study shows that elderly people are not necessarily passive consumers of media content, but actually contribute to TV and radio shows as well. In this series of three articles, LSE’s Wendy Willems examines the role of digital technology and social media in Zambia’s recent elections. She situates this within the broader context of the African continent where both governments and mobile phone operators face a growing number of economic and political dilemmas in relation to the rise of social media. The PI of the project, Prof. Jo Helle-Valle, has recently moved to Harvard University as a Visiting Scholar. The affilation will last until August 2017. Apart from working on data analysis of fieldwork material from Botswana, and manuscripts of various kinds, he will also be able to benefit from the exciting and vibrant academic mileu of Department of African and African American Studies at the African Studies Center. Jean Comaroff, Alfred North Whitehead Professor of African and African American Studies and of Anthropology, Oppenheimer Fellow in African Studies, is affiliated to mediafrica. Her extraordinary competence on Southern Africa, and South Africa in particular, is an invaluable asset for the project. Arrival at a new field site is for the ethnographer often characterized by an overwhelming amount of practical activities towards answering questions like these: Where am I? Do I live here? How do I protect my body and my equipment (and in the long term my mind) from the weather/wild animals/destruction by ritual sacrifice/theft? Can I sleep safely? Do I need to get around? How do I get around? Who do I talk to? How do I address them? How do I respond without facing sanctions? What is dangerous? What is safe? What is good?